Due to water damage from the church ceiling, the casing that houses our beautiful Pipe Organ was deteriorating and plaster was crumbling and falling into the organ pipes. What is supposed to house and protect the organ so that it doesn’t succumb to the elements including dust, debris and water damage was causing those problems. The project of removing the pipes and repairing the organs surrounding structure was completed in 2012. The pipes ranged in size from over 32 feet to less than 6 inches. In addition to these numerous pipes, several other components were ‘shrink-wrapped’ within the chamber to seal off dust and other intrusive elements that were present while the work crew cleaned, repaired, and permanently sealed off all of the areas of damaged stone and plaster. It was very important for us to repair this "safe haven" as to not risk the integrity of all that was recently accomplished in the organ renovation. We want to thank Moe Pipe Organ Company who was hired to take on this very important project. 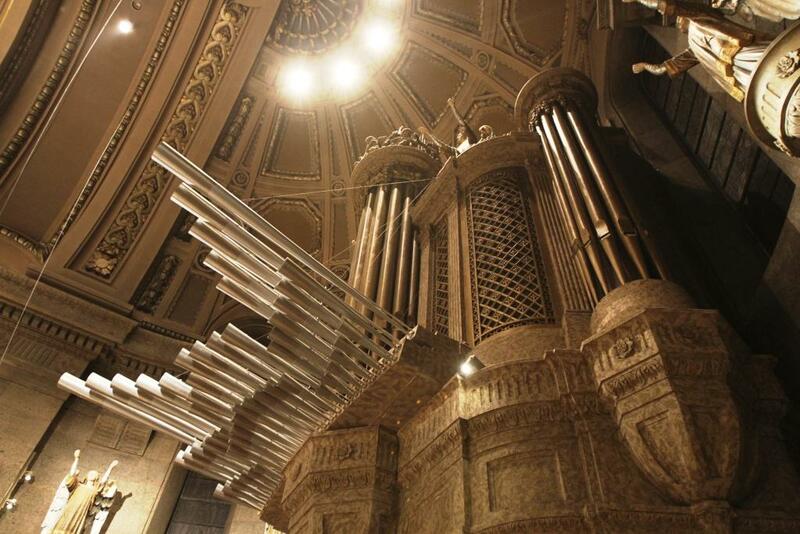 They specialize in the building, service, maintenance, restoration and expansion of pipe organs across the upper Midwest.